Art is nothing if not a reflection of the time in which it was made. Books, films, paintings and sculptures all have the artist’s feet firmly planted in the moment of creation, where a snapshot of the wider world influences — to a greater or lesser extent — can be seen in their craft. Games are no different, and as storytelling evolves along with the technology to depict it and the opportunities for us to shape it in real time, we’re likely to see more and more crossover between the real and digital worlds. The Life Is Strange series is no different. It has always had an unmistakable atmosphere, the result of exceptional writing capturing pockets of life and presenting them in a natural setting, despite whatever supernatural goings-on are occurring elsewhere or how closely linked to the story they are. The overwhelming feeling you get when playing is that of humanity’s essence, both good and bad, which is captured in a way that few games have been able to manage. The first game touched on friendship within a middle-class community; the sequel addresses two young Mexican brothers forced on the run after a tragedy. It may be more overtly political than the first game but that remains a by-product of our current climate rather than the core of the story. This may be Life Is Strange in Trump’s 2016 America, but deep down it’s about family looking out for each other. The voice acting is exceptional: it really makes you care about the pair. The Diaz brothers Sean, sixteen, and Daniel, nine, have the kind of sibling rivalry one would expect for their age gap. 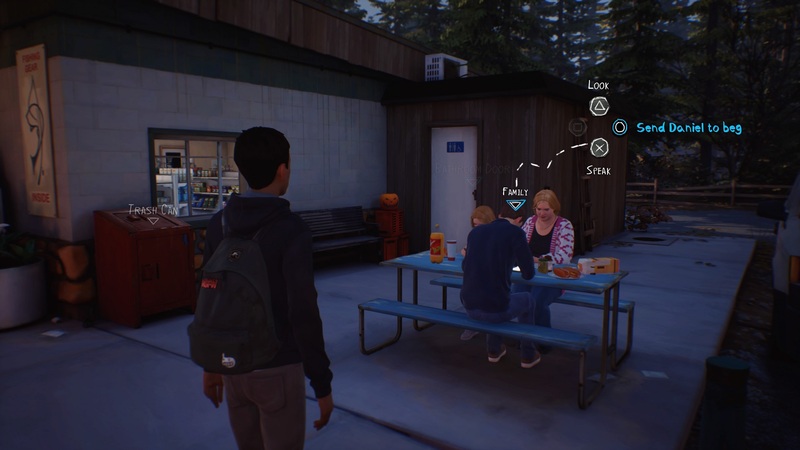 But along with their father, the family unit immediately portrays a feeling of closeness to the player which Max and Chloe’s relationship touched on but never quite cemented. The building blocks that made the original point-and-click a hit are still present: the text messages, the personal descriptions and reminiscences of your surroundings — in this case, a lived-in family house — the events that seem so important to people of a certain age. What pushes this first chapter even further forward is that they’re supplemented by a more immediate and pressing need for survival. 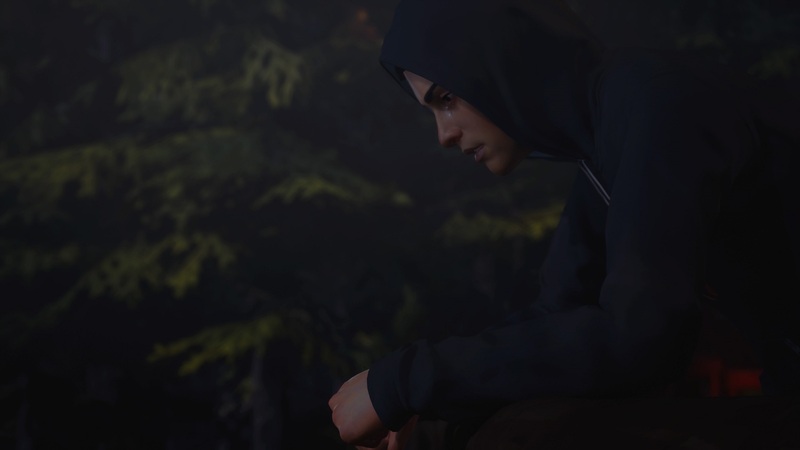 The incoming storm at Arcadia Bay was devastating, but it was also five chapters away. In Roads, the threat is immediate and unknowable, at least to the Diaz boys. The first challenge is keeping them both alive on the road. With barely any money and a hastily grabbed backpack, Sean is thrust into the role of protector at a time in life when he’d much rather be focusing on house parties and girls. The player’s part in this is two-fold: doing what needs to be done to keep up Daniel’s spirits, while presenting Sean as a role model for Daniel to emulate. When you can’t afford to buy enough food or supplies at a petrol station to camp another night, do you risk stealing from the shop owner? And if you succeed, how do you tally that with the effect it has on your brother who may think that this is now an acceptable approach? Conversely, if you take the high road, will your rumbling stomachs and lack of morale be compensated by knowing you did the “right” thing? In my case the decision was a greyer one: paying for everything we could afford but stealing a chocolate bar and water for sustenance. Stealing was wrong, obviously, but the game does such a great job of putting you into the shoes of two desperate boys that I found myself thinking about the greater need. While Detroit: Become Human touched on a similar theme earlier in the year, here the real world setting makes the situation far more relatable. Such decisions, large and small, crop up again and again with the pair. Sometimes it’s as simple as letting Minecraft fanatic Daniel build a fort around your shelter for the evening rather than sending him off to hunt for logs. Other times it’s deciding whether to side with or against him in a stick fight he’s having during play, or whether to scare him with ghost stories just before sleep. How you behave as a big brother will, I suspect, become ever more important over the following four episodes. The supernatural element is different this time around, woven into the story passively rather than being a core mechanic like Max’s time travel ability was in the first game. As such, the choices you make don’t have a do-over option and fit the story better because of it. Despite being native Americans, the Diaz’s Latino heritage leads to a number of uncomfortable encounters, as on point as you might expect with the current political climate. Police brutality and racism, both passive and overt, are all depicted unflinchingly here. It will undoubtedly lead to some internet folks complaining about the game having an agenda, but the sad truth is that the last two years have shown that, if anything, this is a restrained portrayal of rural America. At the back of your mind you're always considering what Daniel will think about your choices. 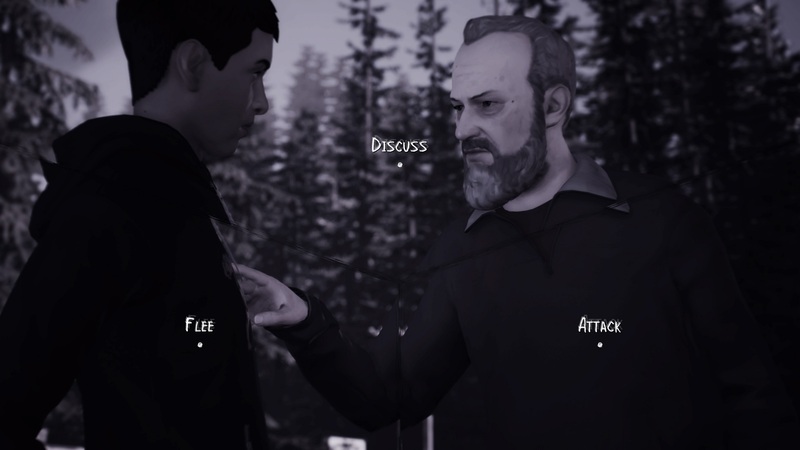 Dontnod has lost none of its ability to truly capture the small moments, the snippets of conversation, the throwaway observations we take for granted. They take the banal and make it exceptional, opening a window onto fictional characters that feel real because the writing is so damn good. With two people comes two options for interaction; not only can you listen to Sean’s take on any given object or person, but often you can get Daniel to join or help as well. Whether you’re explaining trail blazes as you navigate the backwoods or asking Daniel to go and beg for food from a privileged white family, you’re responsible for two individuals even though you’re only controlling one. On that point, navigation feels a lot smoother in the sequel, though in part that may be due to the game’s scope being far wider in comparison. Hiking down trails and along streams gives the impression of a much more open world than the dorm rooms and college grounds of Arcadia Bay, even if that’s ultimately a facade. Still, the act of tilting the camera at objects of interest is as easy as it’s ever been, and though there are some minor missteps (Sean’s drawing sequences are a nice idea, awkwardly executed), on the whole the interface is clean and feels intuitive. The main “puzzle” sequence of the game felt logical and it also helped showcase Daniel’s tenacity in the face of adversity in a tense situation. Though the road is harsh, it makes the moments of relief you encounter even sweeter. The simple acts of kindness from a travelling writer feel like huge gifts, while the thought of enjoying the comforts of a hot shower and a bed in a cheap motel seem like luxury. You have no idea where the boys are headed to, so instead you revel in the small victories on their journey and appreciate the quiet moments, scored as always by the gentle guitar strings the series is now famous for. 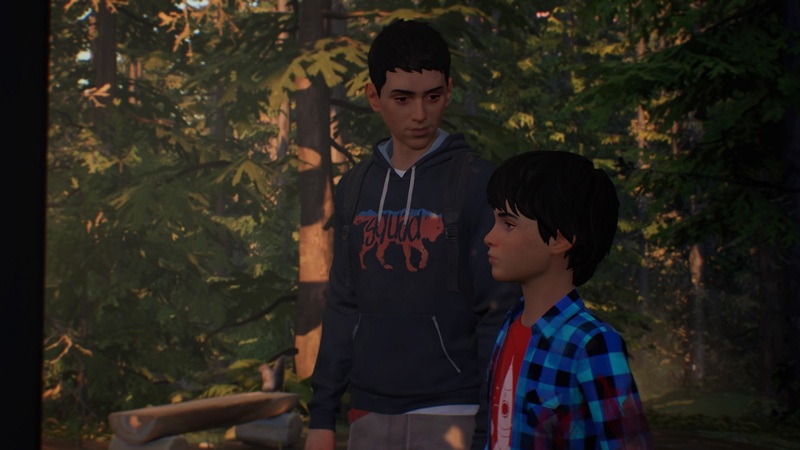 The first episode of Life Is Strange 2 may have dispensed with the original game’s gimmick, but that doesn’t mean the series is any weaker for it. Indeed, this is a brave new world both for the Diaz brothers and Dontnod, and I can’t wait to see where the road takes us all next.